In today’s business world, few terms or concepts are as pervasive—even sacred—as your brand. So, what is a brand, really? It’s not a logo or a slogan or the colors you choose. Your brand is the sum of others’ experiences with you. It’s all the emotions people conjure when they think of you. How your brand feels to others is not completely in your control. But you can take steps to influence how your brand is perceived and deliver an experience that matches the audience’s positive perception to create brand resonance. Lately most of this experience is happening in the online world. So the question arises: Where is your brand in the digital space? The short answer is that it’s everywhere. The longer answer is that when it comes to the online world, your brand is anywhere people engage with you or talk about you. Usually, your website will be the main source of all conversations because it’s where customers come to learn about your company. This is one of the reasons why your web address has to be spectacular – it’s creating the first impression of your business. As a consequence, brands are investing heavily in building a strong digital persona, with each new marketing campaign having its own website, microsite or a landing page. Amidst all this noise, it becomes more and more difficult to be effectively heard. How Do You Brand Your Website? The first step to website branding is getting the right domain name, more specifically, the right domain extension. Over the last couple of decades, a multitude of businesses have claimed some really good domain names; forcing newcomers to scramble for a consolation web address. While this not-so-great web address might look like a reasonable solution on paper; in reality, it winds up being long, unwieldy, difficult to say or spell, and hard to print on business cards. Luckily, where there used to be scarcity in online naming options, there are now more than 1,200 new domain extensions available. Options such as .TECH, .STORE, .FUN, .SPACE, .PRESS, .WEBSITE, and .ONLINE are doing an incredible job of making business web addresses look brandable, cool and functional. It’s disheartening when the name you want isn’t available. That’s where these new options come to play. They are not just a last resort—they’re a primary choice for businesses as large as Emirates (www.emirates.store) and Google (www.abc.xyz). One of the ways to make your name kinder and your branding more effective is to have domain extensions that define your core competence. That’s what makes your brand name more meaningful, memorable and searchable. 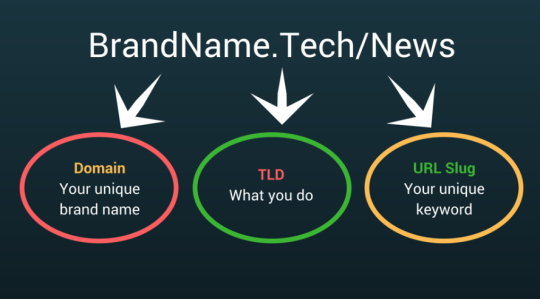 Additionally, one of the biggest benefits of new domain extensions is that the most desirable names are likely to be available on relevant extensions such as .TECH, .STORE and .FUN. A branded link is simply a short link – a shorter version of a URL you want to share online (especially on platforms like Twitter with limited character limits) - built around a brand name or related term. With URL shortening services, brands now have the option to use a shortened link that not only highlights their brand name, but also the content that they share; reinforcing brand awareness and enhancing their brand recognition. Your email address conveys a lot about your brand. It may seem like a tiny detail in the larger branding picture, but it’s supremely important. Having one of the new domain extensions as your website URL can help your brand stand out from the crowd. Your email addresses will start incorporating that domain extension, making your email look intriguing, reliable and trustworthy. In these times of information overload, anything that stands out will facilitate a better engagement rate. If you’re selling products or services, particularly if you’re promoting them individually, then it’s a worthwhile investment to secure those names as domains in relevant domain extensions. These can be specialized landing pages for those products and guide your customers into a sales funnel, either on a separate site or your primary website. You can also redirect the domains to specific pages or sections of your website. Amazon did this with the Kindle. The www.kindle.store redirects you to the relevant page on their main website. In these innovative ways, brands are investing heavily in tools and resources that help them build a strong digital brand. For example, a motor brand launching a “fun” new car could choose carname.FUN and promote it heavily to hammer the positioning well in the consumer’s mind. On the other hand, a co-working space could choose a .SPACE domain to make the website address keyword rich, yet short and memorable. The bottom line is: Your domain name communicates an integral message about your brand and influences your audience’s perceptions. New web addresses are flexible and meant to accommodate a wide range of uses. As the registrant, it’s in your power to register and use them as you see fit. So make the most of it! Alisha is a Content Marketing Specialist at Radix, the registry behind some of the most successful new domain extensions available now through Yahoo Small Business, including .STORE and .TECH. You can connect with her on LinkedIn.